Oh… How much we love the South! 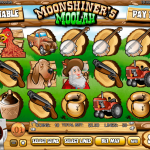 Moonshiner’s Moolah takes place just there and if you ever had moonshine you will really appreciate this theme. This theme basically revolves around everything you could find on the back roads of America for good or for bad. The Wild in this game is the Blonde Lady symbol. She appears on reel 1 and expands to substitute other symbols to create a winning combination. There are also two scatters here. The first one is the Grandpa symbol and landing 3 or more anywhere on the reels will trigger the Bonus Game. In this game you see many bottles of moonshine and you get to pick 3. Each will be worth a prize! 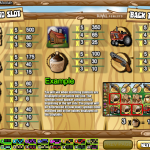 The other scatter is the Chicken symbol and 3 or more will trigger another Bonus Round. In this round you’ll be asked to shoot as many chickens as you can giving you six tries in total. It’s not complicated and you’ll be awarded with nice prizes. Just like moonshine this game is a lot of fun. Not having a Free Spins round is a bit unusual but getting two bonus rounds compensates for that. We think it’s worth giving it a try. Want to test your detective skills? 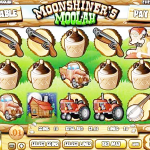 Try playing Moonlight Mystery a 5 reel slot by Rival.